The material, from which these HDPE liners are manufactured is a cross-laminated (electrostatically fused), multi-axially oriented, HDPE (High-Density Polyethylene) Alloy. Because of the multi-ply orientation, the material is extremely strong. It stretches evenly under stress and is considered to be a self-supporting membrane. This Cross Laminated HDPE liner does not require reinforcement for the enhancement of its physical properties. This high density, cross-laminated poly is designed to be UV resistant by a state of the art stabilization system. This HDPE liner is UV stabilized to help protect from the deteriorating effects of direct sunlight. The HDPE liner maintains its strength and flexibility in cold temperatures. Laboratory tests according to ASTM D-1709 (modified or improved test) revealed that this Cross Laminated HDPE liner demonstrated a cold crack resistance of minus [-] 70 º F below zero. Numerous applications in Alaska, Canada and other cold regions throughout the years have proven that this cross laminated HDPE liner can withstand adverse weather conditions. The HDPE Alloy is chemically inert, non-leachable and is resistant to root penetration, rodents and microbials (it is not a food source). Additionally, it meets ASTM D-3083 (Soil Burial). The HDPE liner is not prone to stress-cracking (ESC), thus, making it a very good moisture and Radon barrier. The 20 mil HDPE liner is equivalent to a 30 mil polyethylene in terms of resistance to petroleum compounds, tensile strength, resistance to sunlight degradation (UV) and elongation. The Texas Pollution Control Branch (A Division of the Environmental Management Group) declared that the 20 Mil Cross Laminated HDPE Alloy Containment Liners are a viable alternative to 30 mil polyethylene (dated Oct. 31, 1991). Daily landfill covers have a number of special requirements which will greatly effect cost effectiveness. The frequent pulling of your daily landfill cover across a wide array of rough and jagged edges as you deploy and remove it necessitates that your cover material be extremely durable to resist tears and abrasions. Otherwise you are left with a shredded mess in short order. The patented manufacturing process produces a cover with high tear resistance in all directions. This greatly extends the effective life of your cover. Since you are constantly deploying and removing this cover, you want a light-weight material that can be handled easily by as small a crew as possible for the greatest labor savings. GUARANTEED FISH & POTABLE WATER GRADE SAFE! HDPE Alloy Pond Liners are guaranteed to be 100% Safe for All Fish and Potable Water Applications. Guaranteed safe for potable water applications and for all Aquatic, Plant and Animal life. 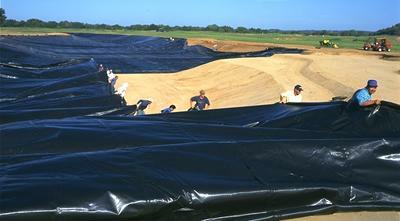 This geomembrane is safe for all underwater applications wherein fish maybe in contact with the surface of the polymer. This cross laminated HDPE Alloy will in no way dissolve in water or emit any harmful chemicals into the water that might adversely effect the fish, plants and/or animals. FDA AND USDA APPROVED FOR ALL GRADES 4 MIL TO 20 MIL INCLUSIVE! HDPE Alloy has FDA and USDA Approved for all grades, 4 mil to 20 mil Inclusive. This material is of polyolefinic nature and as such has been used in Food Contact Surfaces as well as Medical Applications for humans. This geomembrane meets FDA requirements for Indirect Food Additives and for GRAS (Generally Recognized as Safe) under FDA-HFF-335 title 21 Code of Federal Regulations, Sections 177.1500 to 177.2000, inclusive. The HDPE Alloy pond liners are strong, flexible, lightweight, and U.V. Stable. The 20 Mil HDPE Alloy Geomembrane can be pre-fabricated to your specific dimensions from 100 square feet up to 45,000 square feet per panel and larger for thinner mil HDPE Alloy liners. Large, small, round, square, whatever size and shape we can make it for you! The unique patented construction of HDPE Alloy pond liners give you the strength and durability of many thicker liners without the bulk and stiffness associated with other membranes. UV stabilization protects this HDPE Alloy liner from the deteriorating effects of direct sunlight. The high tear and abrasion resistance adds to the durability of the product for a pond/lagoon liner that will provide you with years of faithful service. HDPE Alloy is a uniquely constructed, cross-laminated high-density polyethylene membrane. A patented manufacturing process yields the highest weight to strength ratio available and offers exceptional tear and puncture resistance. Available in a range of weights, thickness' and special composites, The HDPE Alloy products are an ideal choice for a wide range of applications. Pond and lagoon liners, secondary containment systems, floating cover systems for emissions, odor and/or rainwater control, decontamination pads or other uses where superior quality and performance are demanded. HDPE Alloy, where value is the perfect balance of cost and benefit. For pond/lagoon liners, installation and the effective life of the material play a significant role in determining how much you really have to pay. These cross laminated high-density polyethylene liners can be manufactured in sizes up to an acre, virtually eliminating the need for hiring installation crews to field seam multiple panels. In addition, the HDPE Alloy is specifically engineered to provide superior strength and tear resistance at a fraction of the weight of other materials. The light weight reduces the manpower and time required for installation. HDPE Alloy secondary containment liners are made of high density, cross-laminated polyethylene which resists punctures and tears. This HDPE Alloy is UV stabilized to withstand prolonged exposure to sunlight and is not prone to stress-cracking (ESC) so it can endure repeated thermal expansion and contraction. It is Non-toxic and non-leachable so the product will not harm the environment. This HDPE Alloy meets ASTM standards for D-3083 Soil Burial tests and is resistant to root penetrations, rodents and microbials (not a food source). It is flexible, lightweight and easy to install. It has excellent barrier properties and is cold-crack tested to be flexible in subzero temperatures. OSHA, the EPA and a whole host of other government agencies have regulations on environmental cleanup. The last thing you need to worry about is the integrity of your containment membrane during cleanup of underground storage tanks or contaminated soils. The unique patented construction of the HDPE Alloy Geomembrane gives you the strength and durability of many thicker liners without the bulk and stiffness associated with other membranes. We can't end the regulations, but we can give you one less thing to worry about. Custom fabricated to your exact dimensional specifications in any size up to one acre. Small liners are rolled in cardboard boxes. Larger liners and tarps are accordion folded in crates. Roll stock available for immediate shipment! Delivered to your door, job-site or destination of choice. Delivered to your door, job-site or destination of choice.